I've been craving a brownie lately. Cravings like that should not be ignored, as they signal deeply core body needs that must be met on pain of ... some kind of terrible repercussion. Heh. So, I decided to try this recipe for beer brownies. I had some Guinness left over from stew making, and since we don't drink beer, it needed to be used up. It sounds like a weird thing to be cooking with, but it really did make a wonderful taste in the stew, so I thought, what they hey, give it a shot. The original recipe came from ArmyWifeToddlerMom, a link I posted the last time I obsessed on brownies. I did want a more fudgy brownie, so I added a little more butter than the recipe called for, and also a smidgy more chocolate. 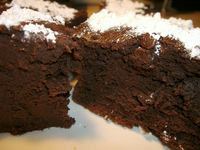 The result was a dense, moist-but-still-cakelike brownie, with a definite flavor twist coming from the Guinness. 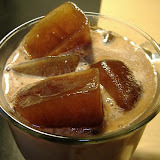 If I make these again, I'll probably use a lot less beer because this is a flavor I just can't get used to. Maybe I'm stuck in a rut, chocolate-wise, because the hubs thought these were the best thing since sliced bread. I didn't tell him they had beer in them, and he didn't seem to notice the beer-ish smell or taste. He just said they were GREAT, and went back for more. Do you suppose it's a man thing? Preheat the oven to 375° F and butter an 8 inch square cake pan. Place butter and chocolate (broken into pieces or chopped) in a saucepan over a low heat to melt. While the chocolate is melting, beat together the eggs and sugar in a large bowl until light and fluffy. When the chocolate is melted, pour into the bowl and mix well. In a small bowl, sift together flour and cocoa. Add slowly to the large bowl and mix well. Last, whisk in the Guinness. Pour batter into cake pan and bake for 25-35 minutes, or until a knife inserted into the center comes out almost clean. Remove from oven and allow to cool. 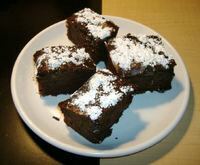 Sprinkle with powdered sugar on top and cut into squares to serve. UPDATE: Interesting side note - I gave these to the hubs' bandmates which consists of 5 guys and 1 girl, and all the guys raved, loved them, scarfed them up. The girl didn't like them. I really wonder if there's something genetic about guys and beer. Something different in their taste buds? Aaahhhh, so maybe I did a bad thing by adding the extra chocolate, too. I *added* to the chocolate texture. If I back off both the chocolate and the Guinness, it might be better. I'll try your suggestion, thanks very much! This brownie seems to be awfully rich in chocolate texture, and while the guinness provides a interesting flavor it is not one that helps to overcome the over richness of the brownie. Rather it provides yet another unpleasent taste to the brownie. I highly recommend replacing the guiness with at least some water, and hiding the richness of the chocolate in perhaps a Black Forest cake or something with other fruits and cream.